I have had a lot of hits, feedback, and enquiries regarding low priced stoves, their quality, value etc. One business that offers solid fuel stoves at very cheap prices is Stove Deals, Blanchardstown, Dublin. They operate mainly through DoneDeal Internet sales site, and do not have a retail premises. Stove Deals offer a 6Kw stove for just €225. It is made, like nearly all cast iron stoves sold in Ireland, by a Chinese Factory. The Chinese brand is called SunRain Foundry. The exact same stove is sold by B&Q only in the UK for Stg£239 or roughly €300. There are some mixed reviews on this stove but the majority are quite positive. I have written before about buying imported stoves. My advice is the same now. Cheaper prices usually mean that there have to be some saving by the manufacturer, so don't expect exactly the same quality as items costing more than twice the price. If you are ordering one of these stoves, buy a spare set of grates and baffles, costing about €55, at the time of purchase - make the purchase conditional on getting the spares. Then look at the results in this way; if the stove gives you 5years good wear it will have cost a mere €45 per year. Chances are, if you use it carefully, you will get 10 or more years out of it. (1) Do you have any sort of show room? Address? No showroom, we use a freight company in Blanchardstown for distribution, but no shop at all. (2) Collection point for cash sales? Collection can be arranged by appointment Mon-Fri from the warehouse and they accept cash, customers should do their research first, then give me a ring when they know what they want! (3) What type of guarantee do you offer? All stoves are 1 year guarantee and buying off us is the same as any other shop, your consumer rights are the same. (4) Do you have spares in stock in Ireland for the stoves you sell. Grates / Baffles / Glass / hinges / handles etc? I try to carry the main spares in stock in Ireland, but we do run out. Best time to order spares is around the end of the season, March - April, so if they are not in stock we can have them before the next winter. (5) You advertise flue pipe and bends on DoneDeal what type of material - enameled steel? (6) You have been selling stoves a few years now - what is the failure rate generally/? Baffles? Grates? Any body failures? I've had 1 complaint about poor assembly, as in bolts not fully tightened and a door loose, other than that I would say about on average 1 stove per container (200 per container) arrives damaged at the customer, either the glass damaged or maybe somebody dropped the pallet. Obviously these are replaced, and there are always people looking for cheap damaged stoves for their shed. (7) Price of a grate for 4Kw stove - and 7Kw stove? 4kW grate €25 - 7kW €30. (8) Price of baffles for the above? Baffles for stoves €25-€35 depending on size. Glass €20-€50 depending on sizes, really only the insert stoves have a €50 piece of glass. Biggest problem at this time of year is keeping stoves in stock! Thanks, Dave. 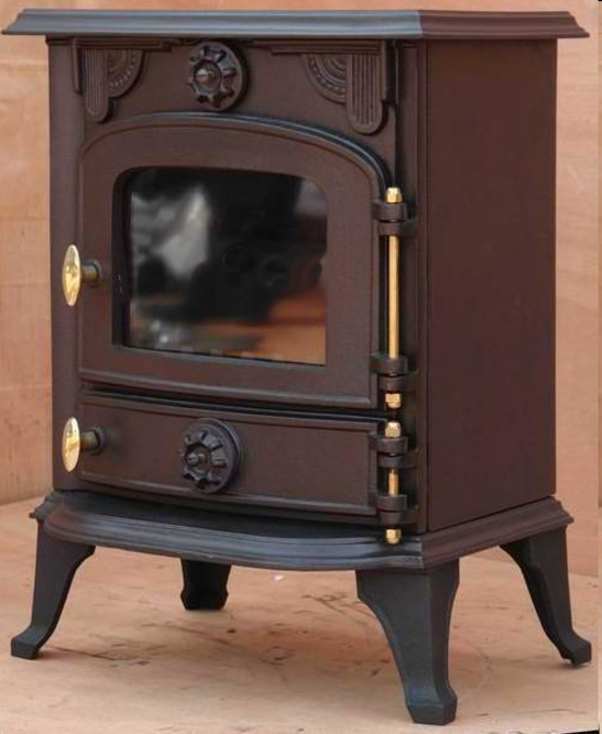 Stove Deals 6Kw stove, a very popular size, is priced at just €225 plus €25 delivery nationwide.